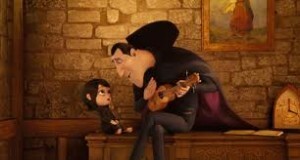 Adam Sandler as Dracula and Selena Gomez as Marvis in Hotel Transylvania (3D). *I laughed from the beginning to the very end while screening the Sony Picture Animation, Columbia Pictures presentation of Hotel Transylvania (3D). The Rated PG film is a very funny, yet very romantic tell of a father’s over-protective love for his daughter and a daughters’ love for a man. Arriving in theaters September 28, 2012 Hotel Transylvania is directed by Gennedy Tartakovsky, and produced by Michelle Murdocca. Written by Peter Baynham and Robert Smigel, it stars Sandler as Dracula, Selena Gomez as his daughter Marvis; comedienne Luenell as Marvis’ shrunken head door-notice; Fran Drescher as Auntie Eunice, and Ceelo Green as Murray the mummy. Selena said she didn’t change her voice, in fact, it seems Adam is the only one that changed his voice to sound “Blah, Blah, Blah” like a vampire. Ceelo Green voice was distinctive, certainly Fran Drescher’s voice is distinctive, and funny girl Luenell’s voice rang out clear as well. I guess he was down for Luenell – who will also be co-starring in Taken 2, out in theaters October 5th and is still doing her stand-up – because here she is in another Adam Sandler film. This great family film also stars Kevin James as Frankenstein; Jon Lovitz as Quasimodo; Adam Samberg as “the human” Jonathan who falls in love with Marvis; Molly Shannon as Wanda the pregnant werewolf; Steve Buscemi as Wayne the husband werewolf; David Spade as Griffin the Invisible Man; Chris Parnell as the Fly, and Brian George as the Suit of Armor. For more information or to see the trailer to Hotel Transylvania (3D) log onto www.WelomeToHotelT.com and for more on Luenell log onto www.HeyLuenell.com. Christian Keyes and LeToya Luckett star in the Tri Destined Studios film Note to Self. Keyes pushed his script right into the hands Image Entertainment who – due to budget cuts – went looking for a partner and found one in Tri Destined Studios. Tri Destined loved the script and felt it fit perfectly with what they wanted to produce. A romantic sports oriented film, Note to Self, also stars LeToya Luckett (Preacher’s Kid) as his love interest, Richard T. Jones (Why Did I Get Married); Eva Marcille (“America’s Top Model”); Clifton Powell (Ray); Valarie Pettiford (Jumping the Broom); Jason Weaver (Drumline), and Brely Evans (Sparkle). Note to Self is also presented by One Village Entertainment and Swirl Films, and produced by ND Brown, Eric Tomosunas, Veronica Nichols, Keith Neal and executive produced by Keyes and Brett Dismuke. For more on the romantic film Note to Self film log onto NoteToSelf.Tumblr.com. *Again this year Doris Bergman’s annual Primetme Emmy Style Lounge and Party was held at the Café’ La Boheme in West Hollywood. The event catered to the Emmy nominees (and supporters) – past and present – offering a wide variety of gifts, with exquisite food and drinks. Co-produced by Michelle Faulkner the event was presented by Qmadix, with Whitening Lightning. The event started early but that didn’t stop the Hollywood celebrities from coming out. I dropped by the all day event and had the pleasure of meeting Carolyn Hennessy (“True Blood”), J Grace (singer opening up for Boyz II Men); Eva La Rue (“CSI: Miami”); Jason Ritter (“Parenthood”); Jamar Rogers (“The Voice” – semi-finalist); Melissa Peterman (“Baby Daddy”); Nicholas Guest (“Sons of Anarchy” – FX); RJ Mitte (“Breaking Bad”); LisaRaye (“Single Ladies” – VH1); Fiona Gubelmann (“Wilfred” – FX), and OKera Banks (VH1 Stylist). My interview with VH1 stylist OKera Banks (Mary J Blide, LisaRaye and Bill Bellamy) was interesting – being that I pride myself on not wearing any name brands and for having my own style – she had some interesting views on styling people. Before I left I could tell it was another fabulous event by Doris Bergman: the food – specially the crab cakes – was superb, the staff – so sweet, and the host Doris, as always, the bell of the ball. Gifts were provided by Rana, SimulTalk, Terox, Dermastart, Hoodswagaa, Mon Atelier, Total Healthy Lifestyle, Twisted Silver, NitroCream, Baron Hats, Executive Clothing, Nu-4U, Spongeables, Ollin Arm Candy, Bon-Bon, Whirl, Lusciouss, Honest Tea, Model in the Bottle, Michael Marcus Cosmetics, Roadkill Rance, Spontungous, Radar Watches and Chocolate Shop. Learn more about Doris Bergman’s events and her Public Relations services at www.GermanPR.com.